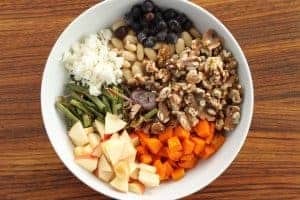 Walnut Roasted Veg Salad is brimming with delicious, good-for-you, healthy ingredients: fiber, healthy fats, and the phytochemicals that protect us from heart disease, diabetes, cancer and brain deterioration. I’d like you to meet my family. My mom and her twin sister were treated for high blood pressure. My aunt was on dialysis for years because of the effects. One grandma died from complications of osteoporosis. The other grandma suffered with pancreatic cancer. My grandpa died from heart disease. My dad was treated for prostate cancer and heart disease. Does my family tree look like yours? 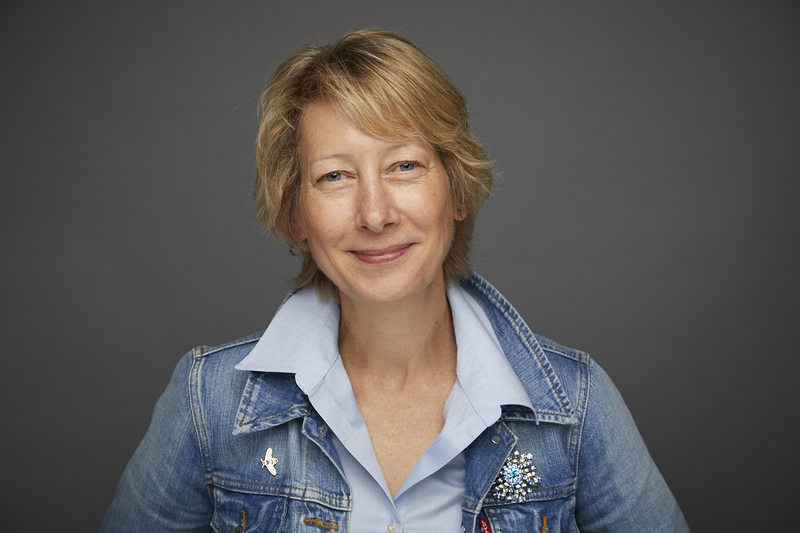 This is a big reason I live the lifestyle I do – to fend off my genes! These three raise blood pressure and blood sugar, cause abnormal blood lipids, overweight and obesity. They also explain the majority of heart disease, stroke, chronic respiratory diseases and some cancers. But they are also within our control. Physical activity is a one-stop shop that improves muscles, blood sugar, mood, and more. Find an activity so you are “On the Move” every single day. Walk the dog, dance around the living room, ride your bike, take a class. Look hard to find something that you enjoy doing so you’ll keep doing it. Food can be a powerful protector so make your kitchen your medicine cabinet. 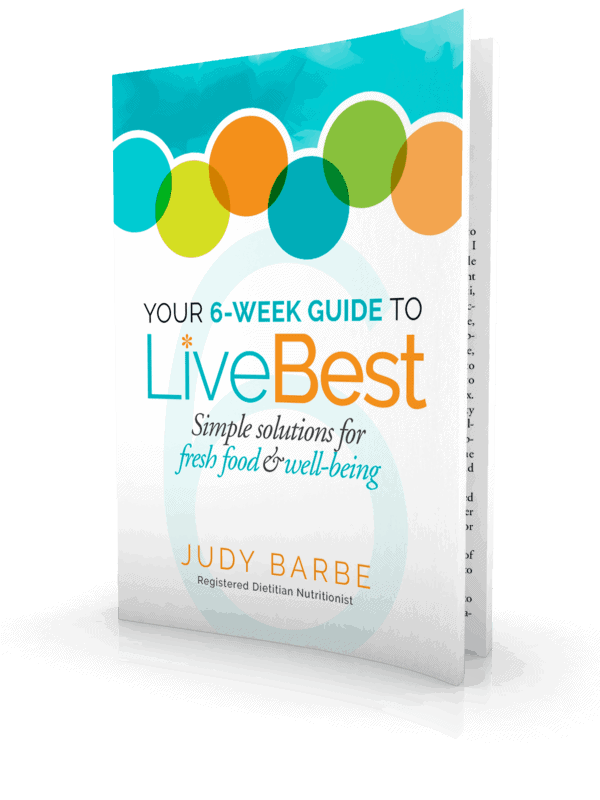 If you need a shopping list, you can download my LiveBest Shopping List. This salad is brimming with as much deliciousness as good-for-you, healthy ingredients including healthy fats, fiber and phytochemicals (plant compounds) that protect us from heart disease, diabetes, cancer and brain deterioration. Walnuts are unique among nuts because they contain the highest amount of alpha-linolenic acid, the plant-based omega-3 essential fatty acid required by our bodies. These healthy fats appear to enhance heart health and reduce inflammation. Beans play a role in reducing high blood pressure, diabetes, cancer and heart disease. Butternut squash is a good source of potassium, which helps maintain good blood pressure. Shallots have 6 times more phytonutrients than a regular onion. Blueberries appear to be beneficial in improving brain and heart health and fighting cancer. You can see why I’m over the moon about this salad. I think it’s a life saver! P.S. Want more healthy living tips and recipes? Sign up for my newsletter right here. 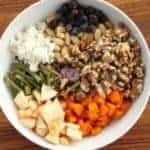 Walnut Roasted Veg Salad is brimming with as much deliciousness as good-for-you ingredients including fiber, healthy fats, and the plant compounds that protect us from some of our enemies such as heart disease, diabetes, cancer and brain deterioration. Place butternut squash and green beans on a large baking sheet. Drizzle with 1 teaspoon olive oil. Stir to coat the vegetables and spread out into single layer. Sprinkle with salt and pepper. Roast in oven for 20 minutes, until vegetables are soft and beginning to brown. Remove from oven. Set aside to cool. On a separate baking sheet, drizzle shallots with a few drops olive oil. Spread into an even layer. Add lemon quarters to the baking sheet, separate from shallots. Roast in oven for 10-12 minutes, until shallots are soft and beginning to brown. Remove from oven. Set aside to cool. Remove 1-2 tablespoons of the shallots to use in the vinaigrette. To prepare the vinaigrette, drop 2 tablespoons shallots, walnut oil, water, roasted lemon quarters, fresh thyme, and 1/4 teaspoon each of salt and pepper in blender. Blend to combine, scrape sides of blender with rubber scraper, With blender running, drizzle in remaining olive oil. Blend for 2 minutes. Scrape sides, blend one minute more. 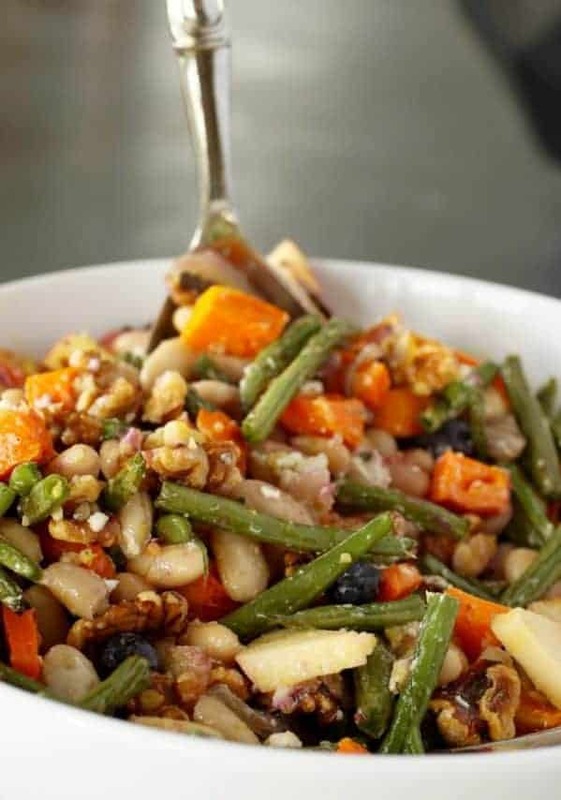 To prepare the salad combine butternut squash, green beans, shallots, beans, walnuts, apple, blueberries in a large bowl. Sprinkle with cheese. Drizzle vinaigrette over salad, stir gently to combine ingredients. What a powerhouse salad– I feel healthier just looking at it! 🙂 I bet it tastes amazing, too. Hey Courtney, I wish that was the power of food – you get healthier by looking at it!! But I (and my family) can vouch for the taste! I love the combination of ingredients you use here! I would never think of having blueberries and butternut squash in the same dish but it looks beautiful and I’m sure it tastes amazing! Hey Rachel, thanks for the note. You’re right about the blueberries adding a beautiful color, and the sweet bite makes it pretty darn tasty! 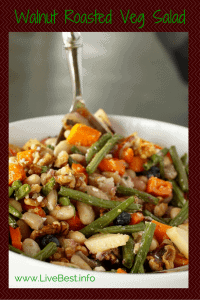 Pingback: 32 winter salads that will fill you up | Luvo, Inc.